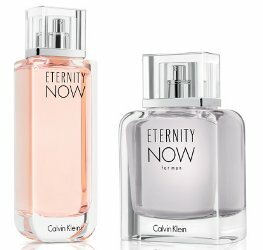 Calvin Klein will launch Eternity Now, new flankers to 1988's Eternity and 1989's Eternity for Men. Eternity Now evokes "the moment in time where you know it's forever", and follows 2014's Eternity Night. Eternity Now for Women ~ a sparkling floral with lychee, quince sorbet, peony, peach blossom, neroli, cashmere veil, ambrox and musk. Eternity Now for Men ~ an oriental fougère with ginger, coconut water, star anise, starfruit, cedar, patchouli, tonka bean and vanilla. The Calvin Klein Eternity Now fragrances will be available in 30, 50 and 100 ml Eau de Toilette and in matching body products. As opposed to Eternity Sometimes? or Not Really Eternity But Only Now? It’s Eternity for the Impatient. I’m holding out for Unending Eternity. Eternity Forever & Always, Eternity Infinity, Eternity Tomorrow. . . The possibilities are endless.